The White House may increase tariffs on $200 bln of Chinese imports to 25 pct. Big firms like Caterpillar can absorb the cost, but an escalating battle could force smaller businesses to close or fire workers. It may require a heavy toll, though, for the president to call a truce. 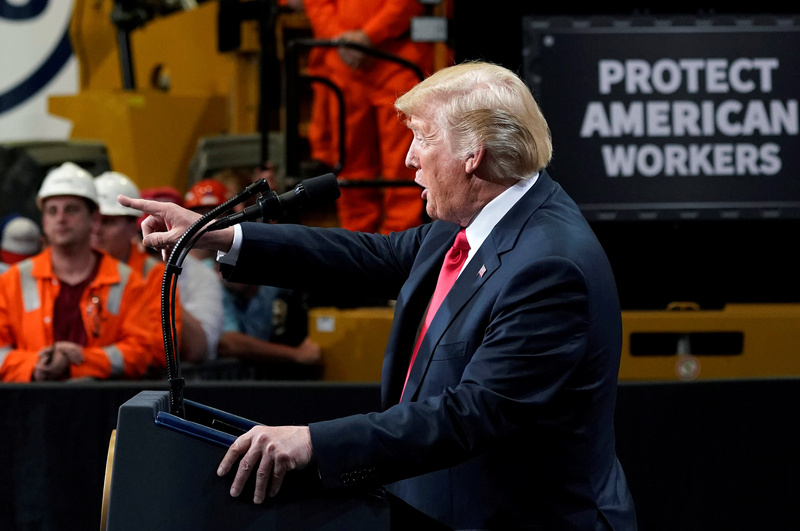 U.S. President Donald Trump speaks about trade at the Granite City Works steel coil warehouse in Granite City, Illinois, U.S., July 26, 2018. China’s Commerce Ministry said on Aug. 3 that the government is proposing a range of tariffs on $60 billion worth of U.S. goods. The timing would depend on the implementation of tariffs on Chinese imports by the administration of President Donald Trump. U.S. Trade Representative Robert Lighthizer said on Aug. 1 that Trump directed him to assess whether a proposed tariff on $200 billion in Chinese imports should increase from 10 percent to 25 percent. The latest proposal delayed the deadline for written public comment on the tariff to Sept. 5 while the due date to request to appear at a public hearing has been extended to Aug. 13. A final decision will be made after the Sept. 5 deadline. The latest list includes various consumer and food products, including seafood, handbags, pet food and bicycles. Separately, the U.S. economy added 157,000 jobs in July while the unemployment rate fell slightly to 3.9 percent, the Bureau of Labor Statistics said on Aug. 3. Economists surveyed by Reuters had expected an increase of 190,000 jobs. Average hourly wages rose by 7 cents to $27.05 per hour, leaving the annual rate of growth unchanged at 2.7 percent, while the labor-force participation rate was steady at 62.9 percent.